Leaves are turning bright colors of orange, red and yellow while plump pumpkins are showing up sporting toothy grins in houses and on doorsteps. I am waiting on my cover design artist to deliver the concept cover for my third book in The Terran Trilogy, The Weight of Gravity. I am also looking for Beta readers to read it. E-mail me if you have an interest. Soon the whirlwind holiday activities will commence, so I’ll apologize now if my blog gets neglected in the near future. With the proposal of String Theory, the idea of a many-dimensional universe or possibly universes, has tickled the fancy of the science fiction genre. I explore this idea in my books, particularly in Someone’s Clone and Time Equation. The idea that there may be more than this reality fascinates me. That’s why I like Charles Stross’s series The Merchant Princes Multiverse. I put Empire Games, his most recent book of the series (having read the others) on my 2018 to-read list. Then I read it. Here’s the lowdown on Empire Games from that suggested series. The year is 2020 and Miriam Burgeson is head of the Ministry of the shadowy Intertemporal Research and Intelligence. The North American Commonwealth is rapidly bringing democracy to a troubled world. In another Timeline, the powerful United States has become aware of the timewalkers who cross in and out the time dimensions and have hired Miriam’s estranged daughter to root out any trespassing spies or illicit traders. Both powerful nuclear nations are on a collision course, and mother and daughter find themselves on opposite sides of an escalating war while operating from two different timelines. I liked the interdimensional espionage found in the whole series, but the earlier books were even better for me. You should read the series from the beginning as it develops along a timeline with the characters’ lives, even as they visit various periods of history (medieval, industrial, current) in their own lives. In one book, Miriam gets trapped in the emerging industrial age timeline, and I was intrigued how she used her knowledge of future technology to build a business and survive as a widowed women when women in business were not yet accepted. In this more recent book, she has ascended to become a powerful person in the current society. Another book that deals with dimensional time is City of Stairs by Robert Jackson Bennett. This one was nominated for a 2018 Hugo in the best series category. The Divine Cities is the series name, and City of Stairs is the first book in the series. Since I like mysteries and science fiction, this hit a hot button of mine. The story is bout Bulikov, a once brutal city that enslaved millions but was protected by powerful gods. Now it lays defeated and devastated by a neighboring country, Saypur. Into this beaten-down city steps Shara Thivani, called to investigate a death, and suspected murder, of an associate who is a distinguished university professor. He was found dead while researching Bulikov’s history. Shara arrives in the guise of a nondescript diminutive junior investigator, accompanied by a towering, fearsome bodyguard called Sigrid. Unbeknownst to her hostile hosts, Shara is of royal bloodline and her country’s top spy. As Shara uncovers the facts of the professor’s murder, she discovers the gods may not be as absent as thought, and the city of Bulikov has many secrets within stairs that seem to disappear into hidden dimensions. I very much enjoyed this story. There are two more to the series that I plan to read. I particularly like the trope of the clever young highbred who everyone overlooks until they realize that she is more than she seems. The relationship of her and Sigrid, her terrifying, yet loyal, secretary is delightful. Twist and turns abound, and not all are from the mysterious stairs. I can’t believe summer is over. Time is a slippery fellow nowadays. Someone’s Clone just hit number #1 in Kindle’s free Books on Genetic Engineering and number #1 on Kindle’s free books on Time Travel. Wahoo! AANNDD…The day is not over, either. #28 in paid Kindle Science fiction. Exciting stuff. But like my days as a stockbroker, sales change hour by hour, and today’s heady success is tomorrow’s tough struggle. 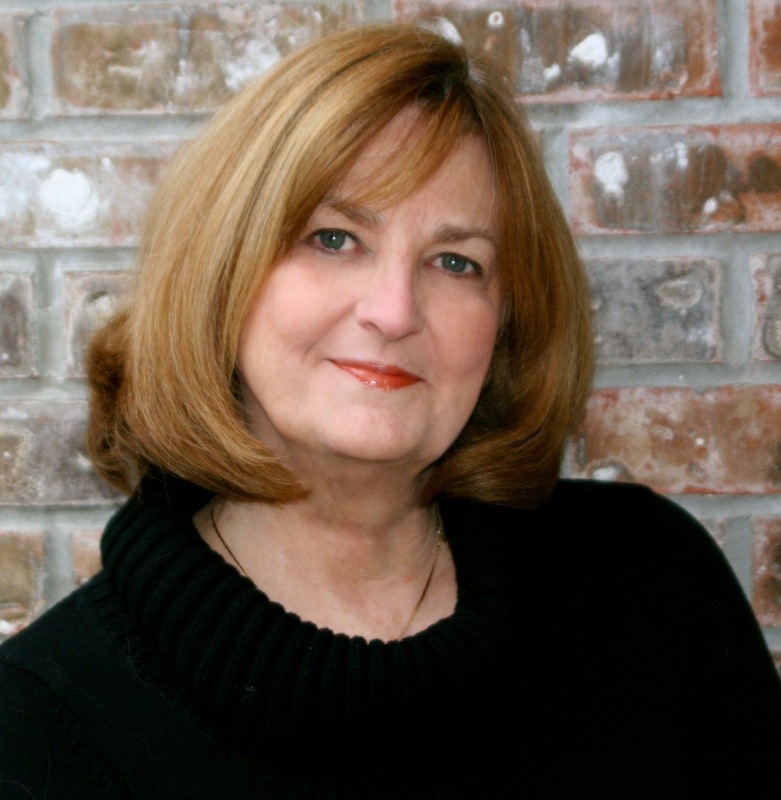 Market on Indie authors. Why the spike in downloads? I enrolled Someone’s clone in KDP Select for July 5 through July 9. It is one of my favorite books in the series and can be read as a stand alone. But since it is positioned at the end of the current series, it was languishing in sales as readers were picking up the earlier books. I figured anyone reading it for free, might become interested in the rest of the series. (which is happening) This is a limited time offer for this book, and will not often be repeated. Now with Amazon’s new policy on reviews, it will be interesting to see if reviews change at all or continue along the the same path. I understand why Amazon is cracking down on reviews. Fake reviews and paid reviews have gotten out of hand so that the customer no longer trusts them. Amazon is all about protecting the customer, so they have stepped up to the plate and cracked down. I just think the process will be harder for the unknown Indie author who likes to write and is not such a strong marketer to get the reviews he or she needs. This week I am reading Cyberpunk. 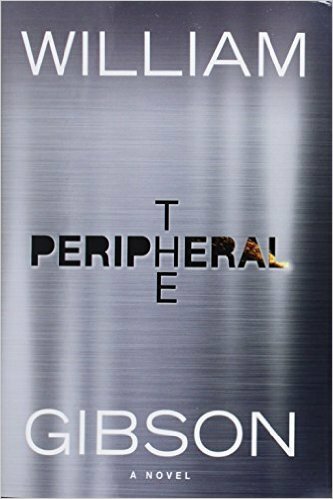 Normally, I like William Gibson, but I am finding his new book, The Peripheral, a struggle. 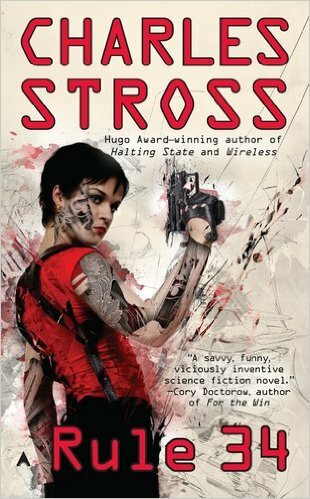 So I switched over to Charles Stross’s Halting State. Both deal with virtual reality and events inside an internet game. Gibson is harder to piece together what is happening because of his constant point of view shifts. In both cases, nerd-tech language is used lavishly and often there’s an inside joke or innuendo. Also characters are not delineated clearly in Gibson’s book. I had to reread an entire chapter trying to find a name to pin to the person talking in the chapter and still couldn’t figure out who it was. Finally, I read the summary which enlightened me to the fact that one of the main characters, Wilf Netherton, lives seventy-five years in the future. The story begins in an apocalyptic near future where jobs are scarce and money is tight. Flynne Fisher earns what she can by assembling product at a 3-d print shop. Her brother, Burton, tries to live on money from the Veterans Association since he is disabled, and often takes on online gaming jobs to augment his tight income. Burton persuades his sister, Flynne, to take over a few observation shifts in a game for him, promising her that the game isn’t a shooter. Still, the crime she witnesses there is plenty bad. Wilf is a high-powered publicist in a world seventy-five years in the future where reaching into the past is considered no more than a hobby. He is working online secretly as security in some on line games. Both Flynne and Wilf will soon meet and realize the impact each other’s world will have on the other. Okay. Confusing in parts for me so far. But, I love most of Gibson’s other books, so I’m soldiering on. 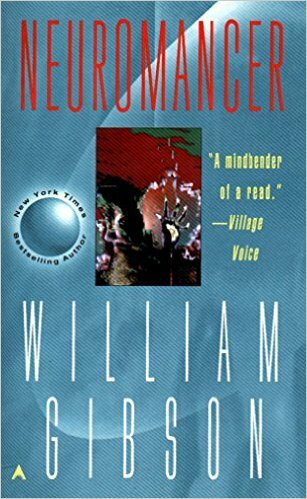 His Neuromancer is the book that began the whole Cyberpunk sub genre and won a Hugo. 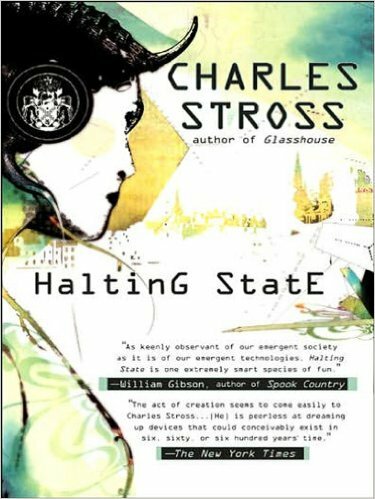 Charles Stross is a Hugo winner also, so I picked up his book Halting State on a recommendation. Be aware that Rule of 34 is the second in this series. Now in Stross’s Halting States, a crime also takes place inside an online game. Susan Smith of the Edinburgh police is called in on an unusual robbery where orcs and a dragon rob a bank inside the virtual reality land of Avalon Four. The company that owns the game, Hayek Associates, is a dot.com start up that just floated onto the New York Stock Exchange and whiffs of impropriety could crash the stock, affecting a number of powerful investors and worldwide financial empires. This one was easier to follow, and not because of my stock broker background. Each chapter is titled with the name of the character in which point of view it is written. However, Stross uses second person which is a bit disconcerting, but is what the gaming world uses in their instructions. Stross also uses a lot of gaming technology and inside tech-nerd slang and information. So far the story is edgy enough to be interesting, but I’m like investigator Smith, who wonders what is all the big fuss about? The more she investigates, the more complex and bigger the case becomes. Looks like a worldwide conspiracy is using Hayek Associates to funnel money around. Sell your Bitcoins before it’s too late. Earth’s ships, lost in space, search for a place to make a home. Will they wander forever in the dangerous universe or find safety at last? A space station offers a midway refuge for Elise’s fleet, but the inhabitants of Alysia are reluctant to allow aliens to land on their planet. Conflict over Alysia’s immigration policy creates violence. The Terran landing on Alysia is long overdue, but the Alysians are anything but welcoming. Richard Steele helps Elise recover several Terrans, kidnaped by slavers and sold into Khalib Allfyre’s harem. But his problems are not over when time traveler, and daughter, Tempest Steele appears in the Timelab to warn him of possible attacking aliens. The Fallen are searching for a habitable planet and Alysia looks just perfect for them. Terran and Alysian must put aside their animosities, build spaceships, and battle a hostile enemy to save the planet. But it won’t be easy. And lives are on the line. A quest to answer a riddle with a time traveling twist. A cosmic entanglement in the form of an alien probe drags Alysia into the space age, but certain factions resist. Some won’t stop at murder to destroy the program. Braden Steele and crew launch into space following a mysterious signal, searching for the aliens that created it. Be careful what you go looking for…because you might find it…Past the Event Horizon. A threatened alien invasion and secret alien gene lab. Alien crystals and cosmic disaster. Not knowing who or what he is, Ailain Stone sets out to save the planet from war. Seven short stories with five elements required in the story. My writers group, after winning several short story awards, put this together in a moment of insane…enthusiasm. All funds go towards Books for Children sponsored by the Willamette Writers. A murder mystery with a science fiction twist. A novella that offers a taste of each book in the Alysian Universe. 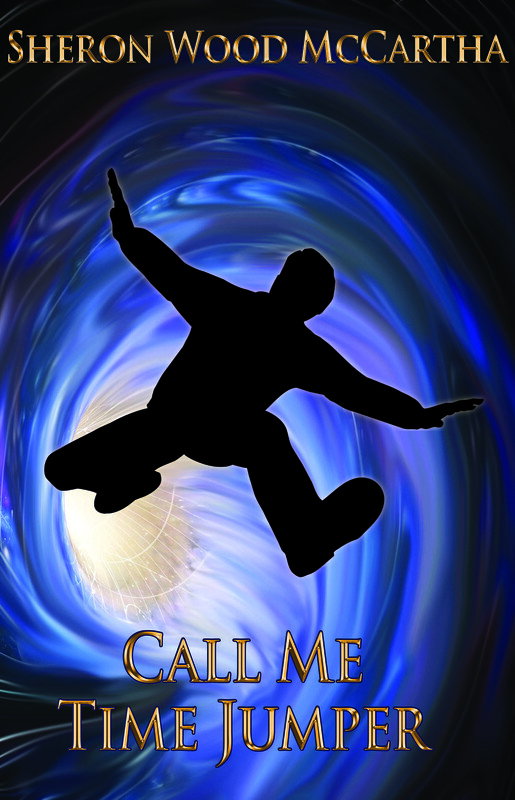 Young Ailain Steele accidentally activates a time gate and tumbles through time trying to find his way home.